Hi friends! Today I am sharing a project using the newest line by my amazing friend Christopher Thompson aka The Tattooed Quilter. 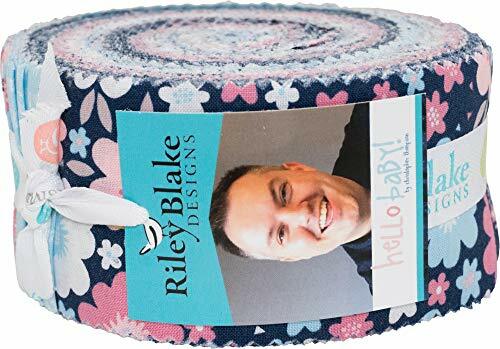 Hello Baby is an adorable baby line for Riley Blake fabrics featuring pinks, baby blues and navy - view the complete collection HERE. I jumped at the chance to play with the fabrics because I have a new pattern coming out at the end of the month - Scallop - and wanted to play around with a patterned fabric on the baby size quilt. Christopher let me choose which fabrics to pair and I love how these different scale prints worked so well together! I love a text print so I was pretty excited to see this adorable addition to the collection. The Baby size Scallop Quilt finishes at 39" x 52" and is a super quick quilt to sew up. The majority of the quilts I have sewn up so far have been in solids so it was a treat to use a small and medium scale fabric on the scallop shapes. So in love with this shade of pink! Be sure to check out all of the other projects coming up featuring Hello Baby by Christopher Thompson for Riley Blake.